When you're at the top of your game, expect a target on your back. As the standard-bearer in the email marketing industry, MailChimp continues to grow and innovate after years of being considered one of the best email marketing platforms for small businesses. It's safe to say that startup email services are gunning for MailChimp in their hopes of cutting a slice of the email industry. There's a good chance that you've used MailChimp at least once in your search for an email platform to deliver your message straight to the inbox of your followers and email subscribers. And if you haven't used the tool for a long time, you'll be surprised with the additional features and improvements it has since then, most of which we will discuss in a bit. However, if you didn't settle for MailChimp as your email marketing tool, there's something that you didn't like or are on the fence about it. This is not an indictment on MailChimp as no software in general caters to everyone. Nonetheless, there are probably features or factors you're looking for that MailChimp and other established tools don't possess. It is only logical in this case to search for other platforms to try on for size. Nowadays, with higher demand for everyone to raise their email marketing game, you may want to look for startups with fresh insights and outlook on how to help you with your email marketing needs. Sendlane fits the bill as an email marketing tool that caters to the new generation of marketers and business owners. But what is it about Sendlane that makes it better than MailChimp and vice versa? More importantly, what makes either of these tools a perfect choice as the software to help you manage your subscribers and send them emails to grow your business? I will answer these questions, among many others, in this Sendlane vs MailChimp review. 1 Sendlane vs MailChimp: what's the right tool for you? 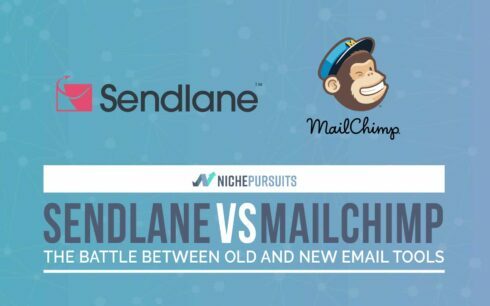 Sendlane vs MailChimp: what's the right tool for you? The question of which tool is the best for you may be misleading. Thanks to the innovations spearheaded by MailChimp and its ilk, almost all of the email platforms nowadays possess the ability to craft beautiful messages and send them to their subscribers. Features like drag and drop builder, landing page creator (see my Instapage review), and marketing automation have become all too common as well. Therefore, what ultimately separates an email tool from another is the target market by which the tool is catering to. How both platforms “sell” their services to their audience will dictate the kind of features both must have. By default, Sendlane and MailChimp are the same because they are both email marketing platforms by nature. But to truly distinguish one from the other, you need to understand who are the target users for each. From there, you can better understand how to use both tools and determine which of the two is the right one for you. Founded in 2013, Sendlane was developed and maintained by entrepreneurs with a slant on digital marketing. They wanted to create a platform that's easy enough to use for marketers with the intent of growing their business. Digital marketers love to dig deep into big data. They are all about automating tedious processes to gather mounds of information about their websites and the ones from clients. For marketers, the fun is in the creation and implementation of campaigns using the appropriate strategies based on the collected data. This reason is precisely what makes Sendlane great for data-driven folks such as yourself. The tool places the onus on the ability to establish a baseline with email data. 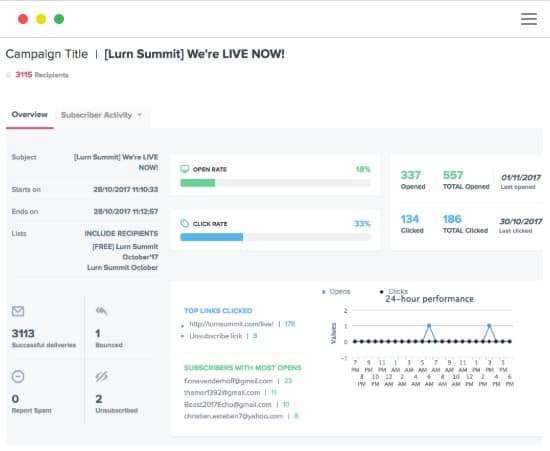 Sendlane provides you the opportunity to watch out for metrics such as the click-through rate, open rate, bounce rate, and others used to gauge the effectiveness of an email campaign. From here, you can determine what works and what doesn't, which will prompt you to create a better and higher-converting campaign than the one before it. If your goal is to increase your conversion rate, whether it's to get more people to join your list or purchase your products, then Sendlane's landing page builder is right for you. The drag and drop feature of the builder will help you create landing pages even without design experience. By dragging and dropping elements onto your landing page, you can be sure that the builder will help bring your vision to life – no coding necessary! However, and as mentioned earlier, drag and drop technology is nothing new among email marketing tools. 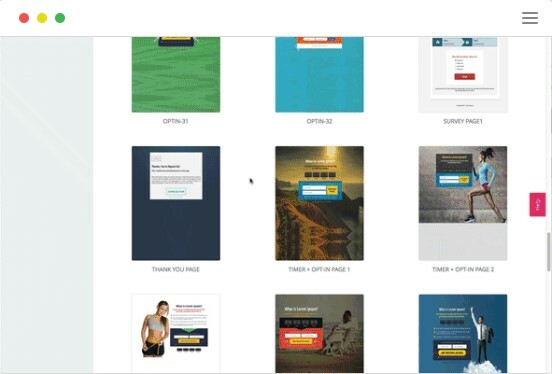 What makes Sendlane's landing page creator better or at least different from the rest are the 50+ choices of pre-made templates. 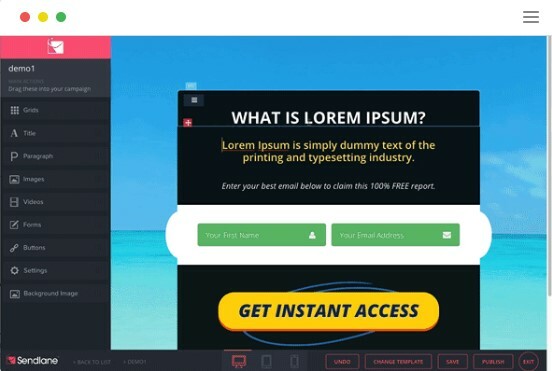 Unlike other landing page builders with limited templates, you no longer have to worry about creating the same-looking landing page over and over again for your marketing campaigns. You can guarantee to come up with a different look and style for your pages to help differentiate yourself from your competitors. At the same, you won't have to start from scratch when designing your landing pages. If you're not comfortable with designing, choose the best template from the list and edit the elements to your liking. You can also include unique items to improve your conversions such as timers and videos. Build your email list or increase your sales using the landing page templates and elements available at your disposal! Lastly, you can create as many landing pages as you want. Sendlane takes away the concern of marketers when it comes to going over the limit with the tools they use. At the very least, Sendlane has got you covered on all your landing page needs. With all the tasks that digital marketers have on their mind, they can only wish to have a clone of themselves to get everything done. As it stands, it's impossible for them to keep track of their current campaign while analyzing the previous one and launching a brand new one all at the same time. To help unburden marketers like yourself from this plight, Sendlane offers efficient marketing automation features that will help you get the job one in the least time possible. Think of the tool as the digital version of yourself. Set triggers and recipes for your campaigns, so you don't have to manually send each of your website visitors or subscribers an email if they did something on your site. You can also create a segment using a tag to determine which among your visitors will receive the email. This feature allows for more targeted messages to users, which leads to higher conversions. Also, what immediately stands out with Sendlane's landing page builder is that you get all their features regardless of which plan you subscribe to. Some tools limit your use of automation features if you subscribe to their most affordable plan. You can only unlock specific features if you pay more. 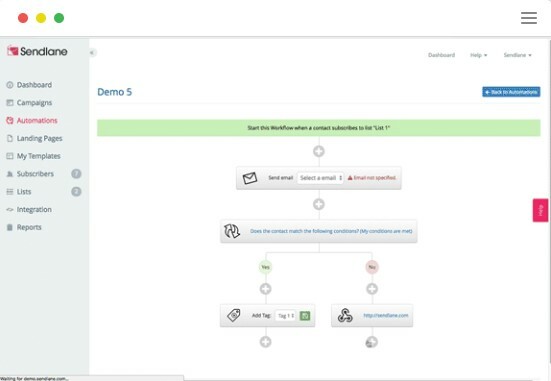 With Sendlane, you won't have any problem with automating your marketing campaigns using it. You will gain access to all features so you can make the most out of your email marketing campaign. The most important thing you should consider as a marketer is the ability totrack and measure the performance of their campaigns. There is no point is launching one if they can't even record how your campaign has fared over time. A campaign without the data to back up its progress is like participating in a competitive sport that doesn't keep track of the score. Using these parameters to draw the line with your campaign, you will have a better idea on how to approach your upcoming email campaigns. For example, if you have lots of spam complaints with your previous email, you need to make your emails spam-free. Maybe you are sending your emails from a problematic domain – consider changing it on your next email. You may also have acquired the subscribers through illegal means (list buying, sending them emails without permission, etc.). Consider these possible reasons among others to lower spam complaints moving forward. You also need to approach other metrics the same way – isolate the issue, determine the potential causes, and test. If you want to use Sendlane, you can use up your 14-day free trial first to see for yourself if the tool fits you like a glove. Once the trial period is over, you need to choose from its paid plan starting at $25/month for a maximum of 1,000 contacts. The price increases if you have more subscribers (2,500 contacts for $49/month, 5,000 contacts for $89/month, and so on). The great thing about Sendlane is that you have access to all its features regardless of your plan. The platform gives you all the tools you need to succeed in email marketing and help you grow your business and contacts faster. Since 2001, MailChimp has been helping businesses reach out to their subscribers and clients quickly and efficiently with its easy-to-use platform. Throughout the years, the email marketing platform has developed features and options dedicated to helping online store owners make more sales and profit. With more and more online shops coming out of the woodwork, it is crucial for them to settle for a software that allows them to build a list and convert them into customers and clients. At the same time, most of these stores will be using an email marketing service of their choice. Therefore, you will need all the help you get to jump over your competitors from the rat race and funnel more leads and customers your way. It is important for online shops to sync up and integrate with all the different tools they are using. Being able to pull data from one tool to another will give you a bird's eye view of your online business. All the same time, integration helps organize the workflow. You don't have to jump from one tool to another to get insights of your store's performance. Thankfully, you won't have this issue with MailChimp. To help businesses make the most of their e-commerce marketing, the platform partners up with the best and well-known e-commerce platforms such as Shopify store, the WooCommerce plugin for WordPress, Magento, PrestaShop, and others. Once you connect your MailChimp to your store, you will have complete access to products that have been purchased by your customers. From here, you can use MailChimp to gather order information and create targeted campaigns to your buyers to connect with them and get them to purchase again. You can also send them automated follow-up emails and personalized order notifications to help create an immersive experience for your customers with your brand. Analytics – View MailChimp data from an analytics dashboard alongside other data from third-party apps to help you make better business decisions. Tools: KISSMetrics, Google Analytics, Klipfolio, etc. Subscription management – Create high-converting landing pages using your favorite builder and subscribers down to your mailing list. Tools: Unbounce, Instapage, LeadPages, etc. CRM – Consolidate your customer data with your MailChimp database to understand your subscribers and customers much better. Tools: SugarCRM, Salesforce, OnePageCRM, etc. To help you increase your sales, you need to take the paid route. There's only so much that you can do with specific marketing tactics. Therefore, ad campaigns should put attract an untapped audience (and even the old ones) to your e-commerce site and turn them into shoppers. When done correctly, you can turn in a profit from the ads you paid for and launched. Google – As one of the largest online ad networks, Google offers you the best chance to attract previous visitors who didn't buy from your site and convince them to purchase. Also known as remarketing ads, you can do this by connecting your MailChimp account to your store. The platform will generate different ad campaigns for you to choose using your best-selling products. Once approved, your visitors will see the ads from sites they visit, and apps they use that are part of the Google Display Network. Also, MailChimp matches the first $50 of your ad campaign to help get it started now rather than later. Facebook – It makes sense to tap into the billions of people on Facebook for your ad campaign efforts. As if that's not incentive enough, MailChimp makes it extremely easy for you to launch your campaign straight from the platform. It will generate an ad using hi-res images from your site. Choose from single-image or multiple-image carousel ads for your campaign. You can test as many as you want and check the results to see which ones converted the best. If you have a landing page created from MailChimp, you can also create an ad specifically for that page. It will also take its images there to feature in the ad. Instagram – The process for Facebook Ads using MailChimp applies to Instagram. Aside from automatically creating ads from your existing images on your site, you can also target the people who will see your ad on the social network. Filter them according to age, gender, and interests, among other parameters, to help you convert better with your ad. Over a period, you can track the progress of the ad and see if it sold any items, added subscribers, and more. You can compare the same set of ads to see which performed the best so you can replicate your success down the line with another campaign. For a tool as useful and extensive as MailChimp, it also has one of the best onboarding processes in the market. If you don't have an email list yet, you can use MailChimp free of charge until you exceed 2,000 subscribers. Compared to Sendlane, you don't have to pay up if you're starting from scratch. Granted, you have access to a limited set of features (you can only send a certain number of emails a month, etc.). Nonetheless, you can send emails, create trigger-based email marketing campaigns, and build landing pages like you're using a premium email marketing tool. Once you exceed 2,000 subscribers, you must pay at least $10/month for your subscription. For that amount, you can build as many subscribers and send as many emails as you can. Aside from that, you get custom branding, phone/chat support, and better targeting and segmenting features. For the full suite of email marketing platform, you can subscribe for the Pro plan at $199/month. Sendlane and MailChimp are two distinct email tools catering to a specific audience. Sendlane provides all the email marketing help for digital marketers while MailChimp is more interested in helping e-commerce sites succeeding in the thriving and competitive market. Judging from their respective features, you can easily see how both can help their respective target users with email marketing. Digital marketers prioritize the efficient collection of data to help provide information on how to create campaigns tailor-made for their clients. Therefore, Sendlane's real-time analytics will immensely help in recording your trigger-based campaigns and landing pages. By breaking down the data provided by Sendlane, marketers will have a field day with the information they have on their hands. From there, they can start building better email marketing campaigns based on what worked and what didn't. However, and strangely enough, you can make the argument that MailChimp gathers as much data, if not more, due to the multiple integrations that you can connect with the platform. As an email marketing tool for online stores, MailChimp helps you build a robust marketing campaign using the existing parameters from its reporting feature as well as the third-party app integrations it offers. For digital marketers, they can use MailChimp and still feel at home as they have multiple ways to gather data effectively and connect with other popular apps. At the same time, you simply cannot beat MailChimp's pricing plan. You won't have to spend a single cent if you don't have subscribers yet but want to build an email list. The toolset available in the free plan is sufficient enough to help you learn the ropes of email marketing and eventually engage with your customers using different email tactics. While MailChimp seems to have the upper hand on Sendlane, some factors work in favor of Sendlane. If you do decide to stick with Sendlane after the trial period, you can enjoy the tool in all its glory, no matter your subscription level. The same can't be said of MailChimp. Also, as a budding startup, Sendlane prides itself with its average response time of three minutes. With MailChimp, you can only reach them via email – phone and chat support are only available for paying customers. There's a good reason why MailChimp is still one of the alpha males of email marketing. While it is marketed towards e-commerce sites, its extensive features allow for use cases that go beyond online stores. As long as you own an online business, you will find something to use with this email platform. However, Sendlane is no slouch either. With just five years under its build and counting, the challenge starts here for this budding startup. There will be growing pains along the way, but Sendlane already has a clear vision in mind – to provide marketers with the best tools and services to engage with their email subscribers and customers. Most of you will probably find MailChimp's pricing and third-party integrations as its strongest points. However, if Sendlane sticks to its strengths by developing its library of pre-made templates and its automation features, it could give MailChimp and other premier marketing tools a serious run for their money. If you have tried out both tools, I would like to invite you to share your thoughts about them. What did you like/didn't like about Sendlane and MailChimp and why? How was your experience in using the tools for your email marketing needs? Feel free to comment below so we can discuss!